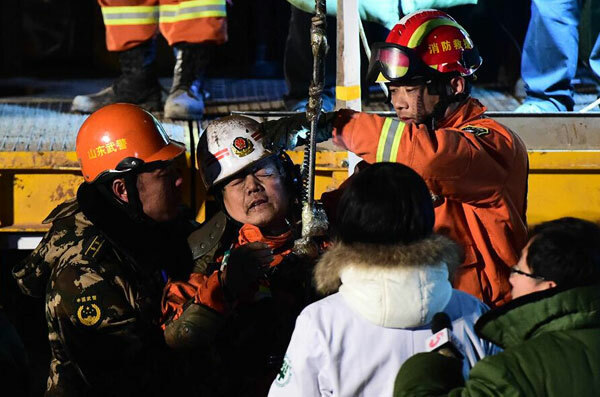 Four miners were rescued from a collapsed mine in east China's Shandong Province on Friday night after 36 days trapped underground. The first was pulled out through an access shaft at around 9:20 p.m. He was brought to the surface in a life-saving capsule, amid cheers from the crowd. The last miner came out of the capsule at around 10:50 p.m. The four were immediately rushed to hospital, with their eyes protected by blindfold. The gypsum mine collapsed on Dec. 25, 2015 in Baotai Town, Pingyi County, when 29 miners were working underground. Eleven miners were saved immediately after the accident. One miner died and 13 others are still missing. Around 1,000 people have worked around the clock to save the trapped miners, despite difficulties such as falling rocks, unstable geological structure, water outbursts and carbon monoxide leaks. A rescue expert said the access shaft had been blocked and severely damaged by rocks that weighed dozens of tons. By far the largest barrier for the rescue was the geological conditions. To reach the miners, the shaft had to be drilled 220-plus meters through limestone, sandstone and gypsum. Rescuers also had to be aware of the danger of underground water, which could have flooded the tunnel if the water-bearing stratum was pierced. To extract the workers, the rescue team drilled two access shafts, one as a backup, using large-diameter drill head. This is the first time that a rescue process such as this has been applied in China, according to the rescue headquarters. Worldwide this is the third time the technology is being used. In 2010, 33 Chilean miners were rescued after being trapped underground for 69 days. More than 600 pieces of equipment, including drills, life detectors and drones, were used in the 36-day search and rescue mission. The owner of the mine committed suicide by jumping into a flooded shaft during the earlier days of the rescue. The county's Communist Party chief, government head and two deputy heads were sacked following the accident. In addition, several executives of the mine are under police investigation. Friday's final rescue operation drew national attention. The national TV network CCTV staged a live broadcast. Social networks were filled with emotional remarks. "Yinxiaoaiclover," a Weibo user, said that "I can not imagine how they survived the 36 days underground." "Life is priceless. That the government and the people did not give up finally created such a miracle," said Weibo user with the screen name of "tianjiao3027328370." The four miners have been identified as Guan Qingji, 58; Hua Mingxi,36;Li Qiusheng, 39; and Zhao Zhicheng, 50. Cao Qingde, deputy head of the local hospital where the miners were being treated, said the four suffered no major injuries and may join their family for the Spring Festival that falls on Feb. 8. Four Chinese miners who had been trapped underground for 36 days have finally been brought to the surface, apparently alive and well. They'd been working in a gypsum mine in east China's Shandong province which collapsed on Dec. 25 last year.